The American Diabetes Association (Association), the nation’s leading voluntary health organization committed to advancing the research, prevention, care and treatment of diabetes, is proud to announce its second annual National Get Fit Don’t Sit Day, May 4, 2016. 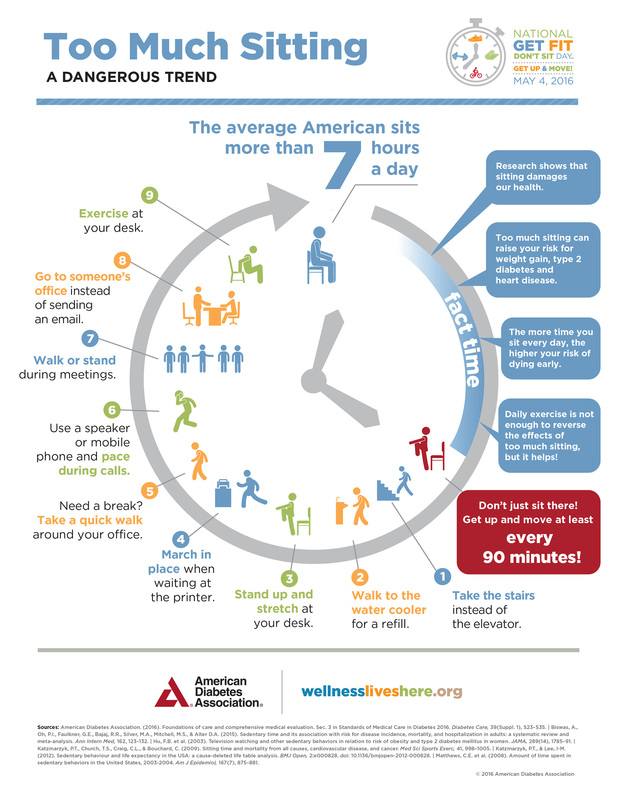 On this Wellness Day, the Association encourages everyone to get up and get moving at least once every 90 minutes throughout the work day to limit the amount of time they spend sitting down, and to lower their risk of type 2 diabetes and other obesity-related illnesses. infographic about the dangers of too much sitting. The Association’s CEO, Kevin L. Hagan, has invited fellow leaders in the health and fitness industry to track their physical activity with a wearable device on May 4, for the CEO Fitness Challenge. The fitness trackers, donated by Garmin, will be synched to a live, online leaderboard on diabetes.org to show how many steps each person has earned throughout the day. Joining Hagan in the CEO Fitness Challenge are executives from partner organizations Sun Life Financial, Lilly Diabetes, Sanofi, Merck, Moda Health, the Portland Trailblazers and Garmin. On May 4, Hagan will also lead the Association’s National Office staff in Alexandria, Virginia, in physical fitness activities during the workday, including a 45-minute nature walk, a yoga class in a conference room and exercises in a pop-up gym in the office’s courtyard. Research shows that sitting for extended periods of time increases the risk of serious health issues such as obesity, type 2 diabetes and heart disease. In a perspectives piece published in the Association’s peer-reviewed journal Diabetes, researcher Marc Hamilton, PhD, Texas Obesity Research Center, Houston, first described the foundation for a hypothesis that light physical activity spread throughout the whole day could be more effective at improving the metabolism of fat, cholesterol and blood sugar than intense exercise for a couple of hours. His current research, funded by an Association grant, explores how interrupting sitting time with light physical activity changes metabolism in the muscles of people at high risk for diabetes who do not exercise. The average American spends more than seven hours sitting down every day, and even the recommended amount of exercise (30 minutes a day, 5 days a week) may not undo the damage caused by prolonged sitting. However, reducing sedentary habits by getting up and moving throughout the day puts Americans on the right track toward wellness and reduces their risk for developing type 2 diabetes. The 2016 National Get Fit Don’t Sit Day, part of the Association’s Wellness Lives HereSM initiative, is sponsored by Sun Life Financial®, one of the largest group benefits providers in the U.S. with an ongoing commitment to diabetes awareness, prevention, education and care. The American Diabetes Association is leading the fight to Stop Diabetes and its deadly consequences and fighting for those affected by diabetes. The Association funds research to prevent, cure and manage diabetes; delivers services to hundreds of communities; provides objective and credible information; and gives voice to those denied their rights because of diabetes. Founded in 1940, the Association’s mission is to prevent and cure diabetes and to improve the lives of all people affected by diabetes. For more information please call the American Diabetes Association at 1-800-DIABETES (800-342-2383) or visit diabetes.org. Information from both these sources is available in English and Spanish.